Medical assistants in Colorado enjoy a fair amount of autonomy compared to some other states, because they are permitted to perform a wide variety of tasks under the supervision of a physician. There are numerous schools in the state for aspiring medical students to choose from. All of them offer either a certificate or associate degree, which means any program can be completed in two years or less. Upon graduation, many medical assistants end up working in the offices of physicians, but some might find work in hospitals, outpatient care centers and long-term care facilities. This guide focuses on what students can expect upon graduation, including salary, job growth and more. A degree in medical assisting is a great way to get a foot in the door of the health care industry. Graduates have the knowledge and experience needed to work with patients by checking vitals, performing examinations, administering injections and medications and other routine tasks. But the first step is finding the right program for your needs. We're helping you out by giving you the research and 2017's top school with a medical assisting program based on factors such as average class size, institutional financial aid opportunities and cost. Explore the best school with a medical assisting program in Colorado below. Morgan Community College offers a medical assisting program that is designed to facilitate students beginning their careers in the medical assisting field. Curriculum includes courses focusing on insurance billing and coding, medical assisting in both a clinical and laboratory setting, and medical office administration. Morgan CC also offers the added benefit of studying from home in an online format, allowing students to have more autonomy in building their academic schedules. Morgan CC also offers a variety of merit based scholarships and grants for qualifying students interested in lightening the financial burden of earning a college degree. Does Colorado define "medical assistant"? Colorado does not offer a specific definition of medical assistants, but the state instead includes them with other professions designated as "unlicensed personnel." Medical assistants fall under the supervision of physicians in Colorado and can be delegated any tasks that are not the exclusive right of a physician or nurse. In other words, they can do anything that does not require a medical license of some kind. The state of Colorado does not require certification for medical assistants. However, some medical assistants in Colorado are certified. This is because some employers prefer to hire those who have earned certification, as it helps show that medical assistants have achieved the minimum level of training and knowledge that is expected to prepare them for the work expected of medical assistants in a typical office setting. Colorado does not require unlicensed medical personnel, such as medical assistants, to complete a formal education or training program. 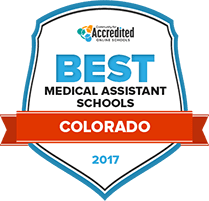 However, some medical assistants choose to seek out a formal education or training program from one of the accredited schools in Colorado. Those who have earned certification must meet certain requirements to keep it current; this might include working a certain number of hours or pursuing continuing education. Recertification is necessary every five years. Are there tasks outside the scope of medical assistants in Colorado? Colorado has not set forth a scope of practice for medical assistants. However, Colorado law states that unlicensed personnel cannot perform any duties that require licensing; for instance, a medical assistant may not prescribe medication to patients. This leads to a very broad variety of tasks a medical assistant could perform, as long as they are supervised by their employer. Colorado medical assistants are paid a bit more than the national median. Below is a comparison of Colorado and national wages, including annual and hourly numbers. The salary of a medical assistant can vary depending on a variety of factors, including experience, training, certification, any specializations, and of course, geographic location. Though salary is dependent upon state, it is also dependent upon the geographical region within that state. The following chart breaks down the median income for medical assistants in different areas of Colorado. Students in Colorado can choose from numerous medical assisting schools and programs. The following spotlight schools offer a sampling of what students can expect when they do decide to pursue their dream of working as a medical assistant. The medical assisting program prepares students for both the clinical and administrative sides of medical assisting. Front Range makes paying for school easy, with many financial aid and tuition discounts available. The school offers a medical assistant certificate program that lasts for three semesters and 46 credits. The medical assisting programs prepare students to sit for the Certified Medical Assistant exam. The college has a relationship with Workforce Centers in Colorado that can provide training and resources for those seeking careers in healthcare. The school offers associate degree and certificate options for students. The associate degree lasts for four semesters and takes 60 credits to complete, while the certificate program is comprised of 45 credits and three semesters. The AAMA administers the exam for certifying medical assistants as Certified Medical Assistant (CMA). The Registered Medical Assistant (RMA) certification is one of the most widely recognized medical assisting certifications. Colorado's law dictating what constitutes the practice of medicine; contains provisions which allow unlicensed medical professionals, such as medical assistants, to engage in certain tasks under the supervision of licensed medical professionals. Representing the medical assistant profession in Colorado, the Colorado Society of Medical Assistants' website contains information relating to the Colorado chapter of the AAMA and upcoming events and news.